Our experience of several Design Thinking projects is that a huge amount of knowledge is produced in a very short time and a lot of decisions are taken. As time goes by, the knowledge dissipates and it is no longer clear why certain decisions were made. The resulting uncertainty makes the team start to feel uncomfortable. In this article, we use a concrete example to show how the knowledge gathered in the process can be captured in an Impact Map and how the Impact Map is used to make transparent decisions. Design Thinking has become a well established methodology for devising innovative ideas. One of the main advantages of Design Thinking is that the team very quickly produces a prototype that makes the idea tangible. That prototype is used to get feedback from the stakeholders. However, there are also weaknesses. During the Design Thinking process a lot of knowledge is created and it is very difficult to capture that knowledge in a structured way. Furthermore, you need to re-focus several times during the project. The team needs a basis on which to make and document good decisions. Both needs - (a) capturing of knowledge and (b) having a basis for making and documenting decisions - are supported by an Impact Map. In Picture 1 we show the tools discussed in this article. Design Thinking is the process tool and Impact Mapping is the structuring tool on which we will focus here. The problem to be solved is often poorly known. This creates solutions that meet the implicit expectations only partially or not at all. The Design Thinking process helps to overcome this issue. First the problem is analyzed so that it is properly and comprehensively understood. This understanding is used to compose a problem statement for a problem that is worth solving. Ideas are generated and validated by prototyping them. In Picture 1 you see a projection of the design thinking process onto the Learn-Build-Measure Cycle introduced by Eric Ries1. It results in the three phases Understand, Ideate and Test. All Phases are characterized by a divergent phase (generate as much information as possible) and a convergent phase (focus on the most promising facts). We use a color code to distinguish in which phase of the process we are working on which artifacts. The Understand phase is used to get a common understanding of the initial challenge. The challenge is noted on magenta sticky notes. Then the stakeholders that are affected by the challenge are analyzed (yellow color). At the end the team gets insights into the needs of the stakeholders (orange color) by running interviews, putting themselves in the shoes of the stakeholders or by looking for analogies from other areas. The synthesis of this phase is in general a persona and a How Might We (HMW) Question. For example, a HMW Question could look like: ‘How might we help the reader to learn something new about Design Thinking’. The goal of Ideate phase is to generate as many as possible ideas how the HMW question can be answered. From these ideas one ore a few number are identified that look most promising to test them. As a prototype is created from these ideas, the result of this phase is very tangible. The goal of the Test phase is to get feedback about the prototype. This feedback will influence all artifacts built in the previous phases – the challenge itself, the stakeholders and their needs. Of course, the feedback will give most insight into how the ideas satisfy the stakeholders’ needs. As described in Gojko Adzic's book2 Impact Mapping it is a powerful methodology to keep focused on a goal - the why, identify the right actors - the who, get the right impacts - the how and finally define the right deliverables - the what. In our design thinking projects we found out that an Impact Map is a very useful vehicle to structure the artifacts (stakeholders, needs, ideas) of the different phases in the divergent phases. The Impact Map also helps to focus again in the convergent phases on the most promising artifacts. These artifacts are mainly the HMW Question and the prototypes. Using the Impact Map in the design thinking projects we identified one major gap where the attendees were not comfortable. As consequence we started to adapt the Impact Map. Where the first two levels (the why and the who) fit perfectly the third level led to confusion or additional steps in the process. 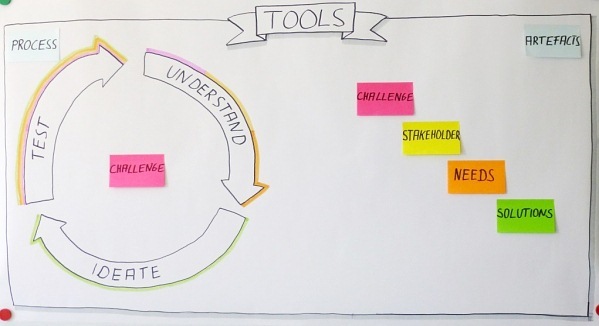 One of the main principles of design thinking is to focus on the stakeholders’ needs. But the needs are not directly linked to the impacts of an Impact Map. Of course they are related as the needs are the stakeholders’ impulse to act as described in the impacts (e.g. the reader of this article wants to learn something new (need) and the impact is that he will read the article). This is why instead of having the impact on the stakeholders, we collected the needs we identified in the Design Thinking process in the map.We had very good experiences with that adapted Impact Map in our next Design Thinking projects. The color code used in Picture 1 also shows how we adapted the Impact Map to our needs. The Challenge is the center of the Impact Map (magenta), stakeholders are the second level (yellow), stakeholders’ needs are third level (orange), and the ideas as next levels (green). In addition we also started to collect the derived HMW questions in the adapted Impact Map as the starting point for the ideation phase. This phase generates a lot of ideas for a possible solution. We added all of them into the Impact Map as possible deliverables (the what). Again we used the Impact Map to focus on the most promising idea(s) that are used to create a prototype. The prototype and the gained feedback is also attached to the Impact Map. Here the next iteration starts. The feedback may force an adaptation of the challenge itself, the stakeholders, stakeholders’ needs or the ideas already generated. In order to illustrate how to work with the tools presented above we would like to give you a short example. In that example we run the whole Design Thinking process cycle and create an Impact Map. An event manager organized a conference and many people registered for the current year’s event. “It would be really great if as many as people would attend next year's conference”, he thought. To achieve that goal he initiated a Design Thinking project and presented the following challenge to his Design Thinking team: "We need a poster for next year's conference so that so many people attend again." The Design Thinking team starts to work on the challenge with the understanding phase. In order to record the results they create an Impact Map. First, the challenge has been added to the Impact Map as a starting point. One team member mentions: "In that challenge an idea to solve the problem - the poster - is already provided. That narrows our view. We need to know the stakeholders that are affected by the challenge and we must clearly understand their needs." 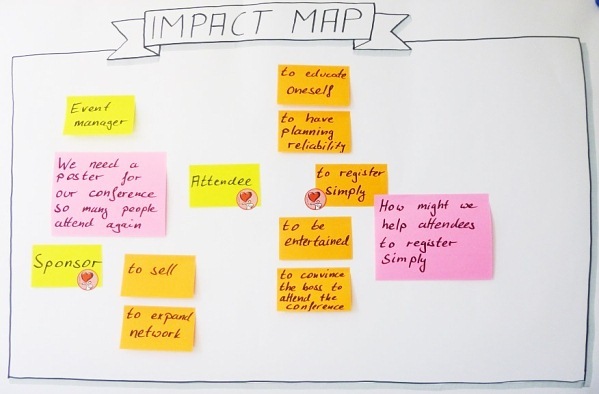 The team identified the event manager, the attendee und the sponsor as the most obvious stakeholders and added them to the Impact Map (picture 2). According to the color code the team uses yellow sticky notes for the stakeholders. “Which stakeholders should we interview first to get their needs? Who is the most important stakeholder?”, asks a team member. The team decided to first interview attendees and sponsors. Both stakeholders have been marked in the Impact Map. After conducting the interviews they identified the needs of the stakeholders based on the interview result. For example the sponsor wants to sell his products and to expand his network. 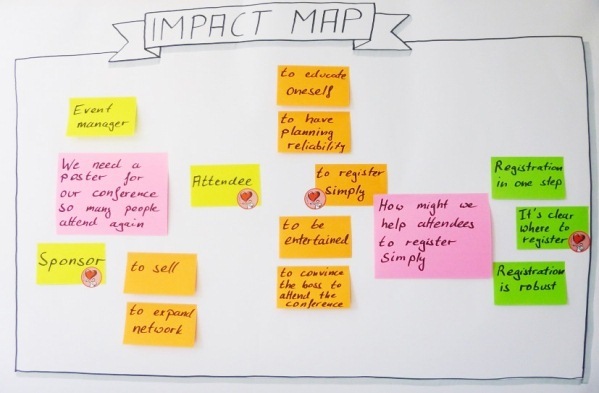 The needs are added to the Impact Map using orange sticky notes. The most surprising result from the interview with the attendee was his wish to register simply. The team identified that need having the highest impact on the challenge. They chose it as the basis for a re-wording of the original challenge. The HMW Question is: How might we help attendees to register simply? That HMW Question is the basis for the following ideation phase. Please be aware of the fact that the initial idea proposal - the poster - is no longer part of the task. Interviews with the stakeholders enabled the team to learn what the stakeholder really wanted. The ideation starts with “negative brainstorming”. This means working out, how we could make the registration for an attendee even more difficult. It is very easy to get answers like 'registration in 1000 steps' or 'we do not tell where to register'. The team collected lots of ideas and inverted them - meaning to fulfill the actual task, to register simply. These ideas are added to the Impact Map (picture 3, sticky notes). Again, the team has to focus and it selected 'It is clear where to register' as the idea that may have the highest impact. In order to visualize the idea and to be able to test it with a stakeholder the team created a prototype (picture 4). The prototype is an arrow pointing to a location where the attendees can already register for next year's conference. The team presented the prototype some attendees of the current conference. 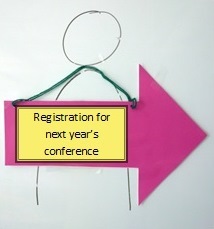 They asked: 'Would you go for registration for next year's conference, if you see that arrow'. The feedback was different. Some people would like to register, but some need more information like time and cost. Taking that feedback into account the next Design Thinking cycle could start yielding a more advanced prototype or focusing on a complete different aspect. In addition the team presented the first prototype and the feedback to the event manager. The event manager was surprised that the simple registration was one of the most important issues. He accepted that the team has dropped his initial idea proposal and offered an alternative proposal that better addressed the needs of the stakeholder. The Impact Map serves as a database in which the artifacts oft the Design Thinking Process are stored. The artifacts created during the understanding phase – the stakeholders and their needs – are pretty stable. Of course, new stakeholders or additional needs could be added based on the feedback in the test phase. Furthermore the ranking of the needs according to the highest impact on the challenge may change in time. For the need(s) with the highest ranking a HMW Question is described and added to the Impact Map. In the ideation phase ideas are added and prioritized according their impact on the HMW Question. For the idea having the highest impact a prototype is created and also added to the Impact Map. Ideas and prototypes are much less stable compared to the artifacts of the understanding phase. As it contains all the knowledge gathered during the Design Thinking process, the Impact Map provides the contextual information with whicht to make decisions. The underlying principle is just to select the artifacts with the highest impact on the challenge. All the decisions are documented in the Impact Map. Dr. Matthias Edinger studied physics at the University of Kaiserslautern and completed his PhD in crystallography at the University of Saarland. He has been employed by SAP AG for 16 years, gaining experience in various product management and requirements analysis roles. His training as a systemic coach complements perfectly the challenges of Design Thinking coaching. Dr. Jürgen Wagner studied physics at the Julius–Maximilians-University of Würzburg and completed his PhD in high temperature superconductivity and has worked at SAP AG for the past 20 years. A Certified Agile Tester as well as a Design Thinking coach, he conducts workshops on the topics of quality and design thinking in which he likes to draw on his wealth of practical experience.